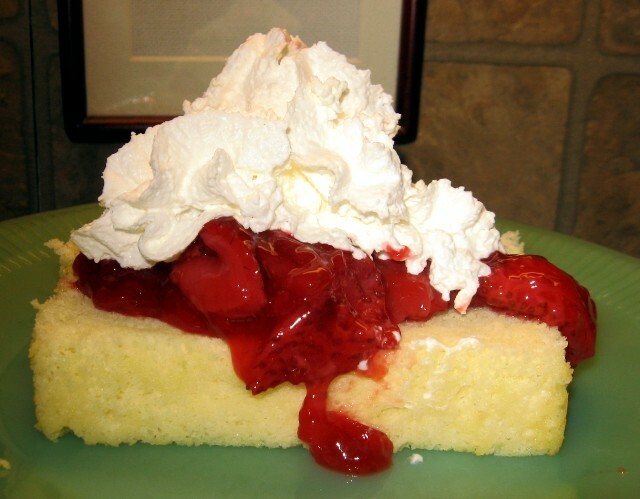 We love strawberry shortcake made with angel food cake or a sponge cake, rather than the biscuit type shortcake. 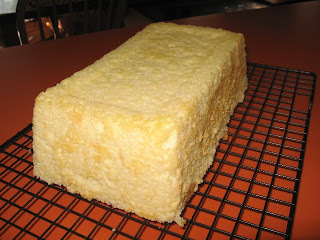 This sponge cake recipe is excellent and if covered well, stays soft and moist for several days. I've served it with berries, mandarin oranges, pudding...you name it. It is light as air and is the PERFECT base for a million different desserts. Preheat your oven to 350F. Spray TWO large (9" x 5" x 3") loaf pans with cooking spray. Line the bottom of each loaf pan with parchment paper (wax paper will work in a pinch) and then spray lightly again. Set aside. In a medium sized mixing bowl, beat the egg yolks, with an electric mixer, for about 2 minutes. Add sugar to the yolks and beat well for another minute or two. Set aside. Heat milk, vanilla, and lemon juice until very warm, but not hot (I used my microwave). Add to beaten eggs (whisk while you add the warm milk to the eggs. Fold in the cake flour. Set aside. In a glass or stainless steel bowl (don't use plastic) beat the egg whites until stiff peaks form. Fold the beaten egg whites into the batter (by hand) until you can't see any white streaks. Be gentle so that you do not deflate the batter (do NOT use a mixer or whisk for this step). Bake at 350 for 30-40 minutes (my oven takes 35 minutes). You will know the cake is done when a toothpick inserted into the center of the cake comes out clean. The top of the cake will be nice and golden brown. Let the cake rest in the pans for about 10 minutes then turn out onto rack. Anything you can imagine would be delicious between layers of this cake. Here I just added a little sugar to a can of mandarine oranges, brought it to a boil and thickened it with a little cornstarch slurry then chilled it. I haven't tried this in cupcake papers, but I don't see why it wouldn't work. I hope you give it a try. 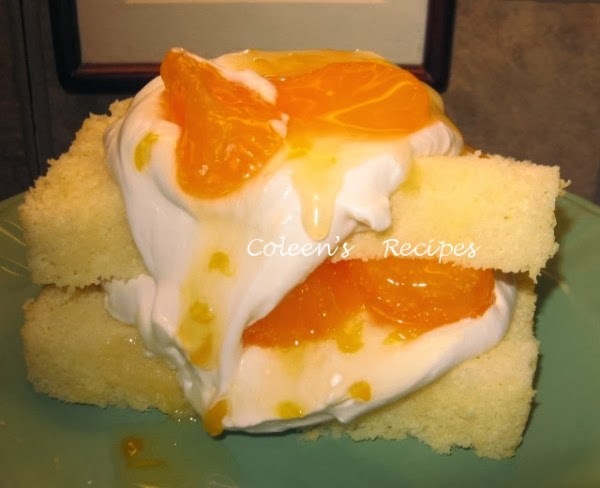 Great cake recipe! !I love sponge cake...And covered with strawberry is just perfect! Looks like a great recipe. Definitely sponge cake over shortcakes any day. What a great looking summer cake! oh i am drooling....if i had to pick my favorite cake it would be exactly this one, with lots of berries and whip cream....very nice coleen! This is similar to the hot milk sponge cake recipe that I've used for years. Sponge cake is so versatile, as you've said. It can be used for so many things. Coleen your recipes are the best! I just can't get over how you consistantly have such delightful recipes! Your Strawberry Fluff has been one of the big hits of my family. I can't wait try the cake and pancakes too. Thanks for adding joy to our day! I have never in my life made a sponge cake, but now I see how gorgeous and delicous yours is, I know I must. It looks FABULOUS, Coleen.